Events revolving around the period between the years 1997 and 2003, which has become known as the Dark Age of Genetics, where the beings created during this time are known simply as 'Daggers'. Daggers that have lived a sheltered life in a type of military camp decide that they want their freedom. Taking the military men on the island captive, they set their sites on the heads of the UEO. 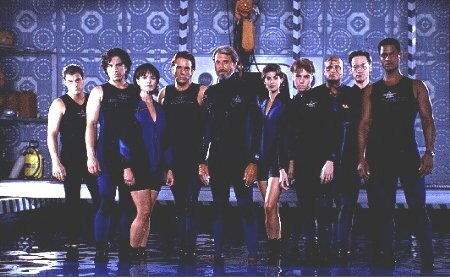 The seaQuest and it's crew must stop Mariah from blowing up all of the oxygen regeneration plants around the world. They must prove to her that the Dagger baby onboard seaQuest needs as much oxygen as humans. Mariah must decide if they are telling the truth. After Bridger's invitation is accepted Extra-terrestrials that are searching for the beginnings of intelligent life are welcomed aboard seaQuest. They are very taken with Lucas and he must choose to go with them, or stay here on Earth. Bridger responds to a plea from an old girlfriend living in an underwater colony that has been dedicated to non-violence. After ten years of peace, the citizens are trying to kill each other. Piccolo's estranged father seeks his help after his wife becomes addicted to an experimental drug. When Bridger and Smith are discovered in an embrace, rumors spread like wildfire about their supposed shipboard romance. In response to the voice of a child calling for help, the seaQuest journeys through an underwater vortex and find themselves 250 years in the future where humans are on the brink of extinction. They must find a way to get the two remaining people on Earth together, or they will never be able to return home. The past can't exist without the future. 30. "The Sincerest Form of Flattery"
An experimental submarine escapes from its moorings and manages to launch its nuclear weapons targeted at New Cape Quest, a city with 5 million inhabitants including relatives of the seaQuest crew. A distress call from an underwater horticultural colony leads the crew into an investigation of the mysterious disappearance of all human life inside the former paradise. When it is discovered, via Henderson bringing one of the plants on board, that it was the plants that killed the people the crew must figure out a way to kill these deadly plants. When a woman is released from a cryogenic institute after 22 years, she is targeted by an assassin. Brody attempts to help her, and discovers that she is his mother. It is found out that General Thomas is behind her assassination attempts, and Brody must rescue her before McGaff finishes what he started. Dagwood maintains his innocence after being found guilty of murdering the genetic engineer who created him, despite having apparently been caught in the act on video. Henderson, Lucas, Brody, and O'Neill are drawn into a furious underwater whirlpool that pulls their shuttle beneath the ocean floor and into a maze of ancient caverns. Meeting up with a scientist, Marcus Rawlings, they must bang together a new submarine in order to escape the caverns. The plot thickens when it is found out that there is only enough air in the pod for 4 people. They must decide who will be left behind. A massive prehistoric crocodile is released from its icy tomb when extensive undersea farming and mining cause the temperature of the South Atlantic to rise. Ford discovers an ancient warrior's helmet and sword that prove that the lost continent of Atlantis did exist. But the helmet may carry a deadly curse that could destroy Bridger and the Ortiz. Ford must over come his seeing a ghost and take command of seaQuest. Time is running out and they need to find a cure. A blind astrophysicist, Tobias LaCont, and a NASA commander, Scott Keller, team up with the crew to battle a hostile alien, hidden in a fallen comet that seaQuest was attempting to recover. When the alien takes Henderson hostage they must find a way to save her. Wendy employs her psychic abilities and risks her life in a battle of the mind against Avatar, a powerful paranormal being who threatens the world's security with his ability to place political leaders into comas. The crew transports a pop star, Sara Tonin, to an island military base where she is to give a concert for the troops. Upon arrival they encounter an apparition of the Greek god Neptune, who mistakenly believes the singer and Henderson are actually Minvera and Medusa, and he wants them to come home, whether they want to or not. A rogue nuclear physicist known only as the Marauder is determined to destroy the seaQuest. As part of his plan, he rescues a revenge-minded dagger, Mariah, who was imprisoned by Bridger. In order to gain control of seaQuest's nuclear weapons, a powerful psychic plants a nightmare in both Piccolo and Dagwood's minds, so that he will be invited on board to interpret their dreams. The seaQuest is captured by an alien spacecraft and taken to Hyperion, a completely aquatic planet. The crew is then drawn into the civil war between the KrayTaks and the Hyperion resistance. The crew must sacrifice themselves and their ship to destroy the KrayTaks before the KrayTaks destroy the small resistance on the other side of Hyperion.